The Streets of Historic Krakow. Strolling the streets of Krakow’s vast Old Town historic district is a most rewarding experience. The original mid-13th-century grid within the ring of mighty city walls has been filled with architectural beauties by the ensuing epochs – imposing churches, grand aristocratic palaces and stately houses of burghers; Gothic, Renaissance, Baroque, Rococo, and Classicist, plus a few of the 20th century. Each Krakow street has its unique character and a climate of its own; each is rich in history and many different stories. And every street lives its own life manifest in its cafes, stores, galleries, assorted culture venues and public institutions. Florianska Street forms the first half of the ceremonial Royal Road. It leads from the main city gate of the same name to the giant Grand Square and is closest thing to the principal street of Krakow. At 45 Florianska St. the Jama Michalika cafe (est. 1895) boasts period Art Nouveau decor. At no. 41 there is The House of Jan Matejko, the great 19th-century painter’s residence turned into a museum. At no. 25 the Pharmacy Museum, possibly Europe’s such biggest. The street ends at the foot of the 14th-century Gothic basilica of the Virgin Mary’s, the city’s chief and biggest church. Every full hour the ancient Krakow Signal is trumpeted to the world’s four sides from its taller, crowned tower. The basilica overlooks the Grand Square, Europe’s largest medieval city square. Over the last 800 years the Florianska street witnessed countless glorious processions: coronation, funeral, royal wedding, etc. Nowadays the former thoroughfare has been taken over by pedestrians and Florianska Street remains Krakow’s busiest shopping area. Grodzka Street from the 9th century on used to form an axis of Poland’s capital prior to the location of medieval city of Krakow around the Grand Square in 1257. Leading to Wawel Hill’s royal castle and cathedral, the street has witnessed all kinds of processions passing by in step with history. One block down the Grodzka street from Krakow’s central square there is an open space flanked by two grand 13th-century temples. Left, the Gothic basilica of Holy Trinity dwarfs the adjacent Dominican monastery. Right, the Romanesque basilica of St. Francis’ adjoins a Franciscan monastery. Both monasteries boast the 14th-century great cloisters full of art. The Franciscan one neighbors the 1560 Renaissance Wielopolskich Palace, Krakow’s city hall since 1865. Further down the street a charming plaza spreads before an ornate white facade of the imposing Jesuit Baroque church of St. St. Peter and Paul’s of 1619 next to the grand Romanesque church of St. Andrew’s of circa 1090. Kanonicza Street ends just at the foot of the hilltop Wawel Royal Castle and used to constitute the last, most glorious and scenic part of the Royal Road, Krakow’s ceremonial route. Lined with stately, mostly Renaissance houses, it is arguably one of Europe’s finest streets. In its half a charming plaza unveils the white facade of the imposing Baroque church of St. St. Peter and Paul’s of 1619 next to the grand Romanesque church of St. Andrew’s that dates from the late 11th century. Golebia Street (i.e. Pigeon St.) has been the axis of the Krakow university quarter for nearly six centuries. Till the 14th century a small Jewish quarter bordered here on the borough where the Polish potters dwelled and toiled. When the Grand College, Collegium Maius, was established nearby in 1400, various academic institutions mushroomed soon along the street. The Collegium Minus at 11 Golebia street, built for the younger philosophy faculty in 1449, now shelters the university’s Institute of Archeology. The huge Neo-Gothic Collegium Novum of red brick at 24 Golebia street, on its western end, was built in 1887, and is home to the Krakow university’s headquarters. Nowadays students no longer live here and most of them study on modern premises outside the Old Town historical district. Yet the old colleges still form the hub of the Jagiellonian University. So, there is no shortage of patrons for cafes, specialty shops, boutiques and the like, which line the Golebia Street. Jagiellonska Street runs parallel to the western side of Krakow’s central Grand Square and connects Poland’s two most prominent cultural institutions. At its one end there is the 630-year-old Jagiellonian University with the Collegium Maius, a marvellous 15th-century college turned into a university museum. Stary Theater, Polish oldest and a home to the country’s best company of players, stands at the other end. Sw. Anny Street till the 14th century formed the oldest Jewish quarter of historic Krakow. In 1400 the Jagiellonian University moved in. Its 15th-century splendid Gothic Collegium Maius welcomes visitors in the middle of the Sw. Anny (i.e. St. Anna’s) street. The former college attended by Copernicus now houses the university museum and its world-class exhibits. Two younger colleges stand next to it: the 17th-century Baroque one and the 19th-century classicist edifice where two Krakow’s physicists achieved the first ever, breakthrough condensation of the oxygen and nitrogen from the air. The opposite university church of St. Anna’s of the late 17th century is a wonderful example of the majestic Baroque architecture at its best. Szewska Street (i.e. Shoemakers’ St.) has been known at least since 1309 under its current name after the trade most common here in the Middle Ages. It was important for medieval Krakow’s economy as the city shone in the production of excellent footwear. Nowadays the Szewska street still counts among the historic Old Town’s busiest, though the likes of Casio, Sony and Levi’s replaced local wares while shoemakers gave way to jewelers, nightclubs and cafes. Karmelicka Street, once an old road westward from Krakow’s medieval Szewska Gate, was changed at the turn of the 20th century into a fashionable boulevard. Extramural cottages and gardens gave way to solid buildings in eclectic style. Nonetheless, the Carmelite church with adjacent monastery, dating back to 1087, has remained the Karmelicka street’s prime landmark. The 17th-century Baroque temple is mostly known as a shrine of the Blessed Virgin of Piasek, a 15th-century miraculous and sacred wall painting. Mikolajska Street (i.e. St. Nicholas’ St.) constituted once the first part of the important trade route to Kiev in Ukraine. In the Middle Ages it led from Krakow’s central Grand Square to the city’s eastern St. Nicholas’ Gate whose Gothic stone arch can be still seen from the Planty gardens in the outside wall of a baroque convent. The nunnery and its church of the Holy Virgin of Snow were built on the site of the gate fort in the 17th century. Pijarska Street forms the northernmost border of Krakow’s Old Town historic quarter. Unassuming as it seems the picturesque byway links some of the city’s best attractions. It lines the preserved section of the city walls of circa 1300, complete with the 14th-century main gate, the giant Barbican of 1499 in its front, and the 16th-century municipal Arsenal. The last building, together with the adjacent 18th-century former monastery and the Neo-Gothic Czartoryskich Palace across the Pijarska St, houses the Czartoryskich Museum, by far Poland’s best collection of the Old Masters, whose crown jewel is Leonardo da Vinci’s fabled ‘Lady with an ermine’. The museum adjoins the 18th-century church of the Transfiguration whose fancy baroque facade shields grateful interior, enlivened with illusionist depiction of heaven on the ceiling frescos. Next the Pijarska street borders on the Planty string of public gardens. The street ends at the wall of the 17th-century picturesque monastery and the church of St. Casimir’s (available on the turn to the left). The part of the Pijarska street adjacent to the old city walls serves as an open-air gallery of sidewalk artists, who adorn the ancient fortifications with their canvases for sale. Szpitalna Street (i.e. Hospital St.) is marked at its northern end by the splendid edifice of the Juliusz Slowacki Theater whose architecture, compared to the famous Paris Opera, was once considered a model and copied throughout the Eastern Europe. In 1893 it was erected in the place of demolished buildings of the 14th-century hospital which gave the street its name. Further down the street there was also Scholar’s Hospital whose beautiful 15th-century building has survived at 21 Szpitalna. The baroque church of St. Thomas’ and the adjoining convent date back to 1618. The opposite building at 15 Szpitalna St. was constructed for a bank in 1883 and represents northern Neo-Renaissance in its best. Sw. Jana Street (i.e. St. John's) leads from the city’s central Grand Square to the Czartoryskich Museum, Poland’s best collection of the Old Masters including Leonardo da Vinci’s fabulous masterpiece, ‘Lady with an Ermine’. Yet, instead of rushing, you had better enjoy the stroll down one of the finest streets of Krakow’s historic Old Town quarter. Sw. Jana street was named after the 12th-century church in its middle which owes its present charming Baroque to the renewal in the 18th century. The street is lined with palatial residences of noblemen and stately houses of rich burghers. Their Gothic, Renaissance, Baroque and neoclassical portals delight those with an eye for architectural detail. And few stay unmoved by a vista of the 18th-century Piarist church of the Transfiguration at the end of the street. Behind the church’s fancy Baroque facade one finds grateful interior with illusionist depiction of heaven on the ceiling frescos. The Sw. Jana street’s chic boutiques, art galleries, cafes, and numerous nightspots is frequented by bohemian types. Stolarska Street just a block away east of Krakow’s Grand Square was named after carpenters whose workshops used to line it from time immemorial till the 1960s. Nowadays the “Joiners’ Lane” has been taken over by foreign diplomats. Three consulates operate here side by side: the American, the French and the German ones. Of those the American Consulate General at 9 Stolarska street is by far the most popular, notably among the visa-seekers from the southern provinces of Poland. The street runs along the vast compound of the Dominican monastery that dates back to the 1222. It ends at the foot of the friars’ 13th-century basilica of the Holy Trinity rich in masterpieces of sacral art it accumulated over the ages. The grand stairs at the left wall of the nave lead up to a Baroque mausoleum of St. Jacek (Hyacinthus) in the former cell of the 13th-century Polish saintly monk. Slawkowska Street Believers adore the medieval crucifix in the church of St. Mark’s at Slawkowska Street for its miraculous powers; nonbelievers simply admire the masterly sculpture. The 13th-century church was rebuilt in the 15th century when it acquired the present picturesque Gothic outer form. Its interior dates back to the late Renaissance. St. Mark’s church is also a shrine of the cult of Blessed Michal Giedroyc, a saintly visionary who lived here in the 15th century. Just across the street one finds the seat of the Academy of Sciences (Akademia Umiejetnosci), a venerable 180-year-old scholarly institution. Slawkowska street, originally a part of the commercially important route to Silesia and further on to the Western Europe, became one of Krakow’s principal streets as early as the 13th century. 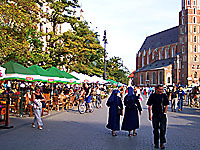 It remains one of the busiest in the city’s historical center. Sw. Tomasza Street (i.e. St. Thomas’) has run parallel to the northern edge of Krakow’s central Grand Square at least since the 14th century. Yet the street acquired its current name barely a century ago, which is hardly typical for the Old Town quarter with its ages-old street names. It is divided roughly in half by the church of St. John’s which dates back to the 12th century and was given a Baroque facelift in the 17th century. The street creates a most charming corner where it goes round the temple. The 1618 church of St. Thomas’ after which the street was named stands two blocks farther at the corner with the Szpitalna street. The Sw. Tomasza Street is lined by numerous charming cafes, some counted among the city’s trendiest. The 19th-century hotel building at the corner with the Sw. Jana street has been turned into an entertainment complex with a cinema, Krakow's biggest jazz club, and more. Poland's prime tourist attraction and a must-see in Central Europe boasts numerous world-class monuments, charming vistas, delightful atmosphere, and the best restaurants. The most beautiful of Europe's ancient streets,arguably. The best way to enjoy old Krakow is afoot.